Designed for fast removal of ferrous and non-ferrous tubes from Condensers, Heat Exchangers, and Boilers. We manufacture wide range of Hydraulic Tube Pulling Gun under the Brand name AIRXPA TOOLS. We are engaged in offering the finest quality Hydraulic Pulling Gun. We are engaged in manufacturing, supplying & exporting a comprehensive range of industrial Hydraulic Tube Pulling Gun installation, removal & maintenance tools. These equipment are known for their efficient functioning, user-friendliness & durability. This unit pulls tubes continuously through the gun. Both electric and pneumatic power packs can be used. Power pack allows up to 350 bar working pressure. 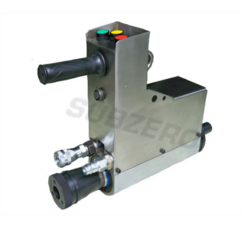 We offer impeccable range of hydraulic tube pulling gun. In these products, TPG - 15 used for Light Duty Condenser Work, TPG - 30 used for Heavy Duty Heat Exchanger and Light Boiler Work, TPG - 45 for Heavy Duty Stub Pulling in Boilers. Our products are highly demanded for these excellent features like ease of operation, low maintenance and less energy consumption. Pulling Guns supplied with Pull, Return, and Autocycle switches Proximity switches used in place of micro switches for longer life. TPG - 15 used for Light Duty Condenser Work, TPG - 30 used for Heavy Duty Heat Exchanger and Light Boiler Work, TPG - 45 for Heavy Duty Stub Pulling in Boilers.